Earlier this year, Senior Editor Michael McWhertor took a couple days off to appear as an unpaid Tester panelist and have Adrianne Curry touch his shoulder. The latest trailer for The Tester Season 2 gives a taste of what is in store for the reality show contestants: gaming, crying and screaming. Haven't seen it yet obviously, but it sounds like they bit off more than they can reasonably chew. The Tester Season 2 debuts on November 2 and features longer episodes with more of a reality TV bite. 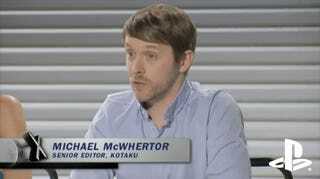 See that blue button-up shirt McWhertor is wearing? Edgy.